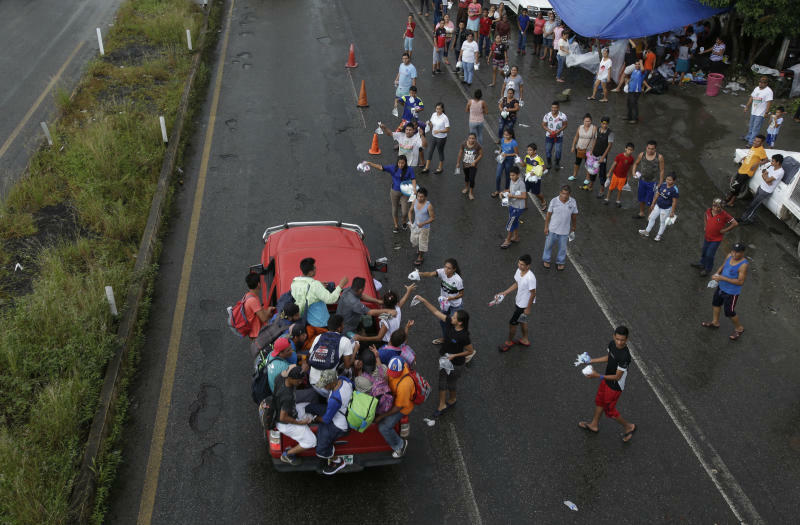 The first waves of Central Americans in a huge migrant caravan have begun arriving in the southern Mexico town of Huixtla after an exhausting eight-hour walk. The first to arrive are quickly staking out grassy spots in the town square where they will sleep Monday night. Marlon Anibal Castellanos is a 27-year-old former bus driver from San Pedro Sula in Honduras. He roped a bit of plastic tarp to a tree to shelter his wife, 6-year-old son and 9-year-old daughter. Castellanos says the family walked for six hours until they could go no farther and then paid a passing van 25 pesos ($12) to take them the rest of the way. He says there are no ambulances if the kids should pass out in the heat and no medical care to speak of in the middle of the countryside.